Given that NBC’s new series, “Parenthood,” was inspired by the 1989 Ron Howard film of the same name, it was hard to resist the opportunity to take a look back at some other programs which originated on the silver screen. Obviously, Hollywood has never been afraid to recycle its properties – because, y’know, it’s just so much easier – but when you’ve got a good (and familiar) premise and you’ve got writers who know how to build on it, then why not take advantage of it? 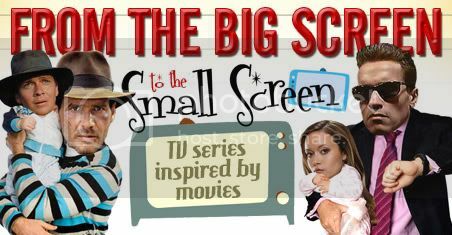 Not every film deserves to be turned into a television series, a fact which is borne out by this list of 15 such shows that never got past the pilot stage (and sometimes it worked just as badly in reverse, as you can see here), but looking back on the television landscape and seeing what classic series have emerged as a result, it’s hard to complain. First up, a list of our 20 favorite series inspired by movies. You’ll likely disagree with some of our choices, but…well, frankly, you always disagree with some of our choices, and we’ve learned to live with that. 1. 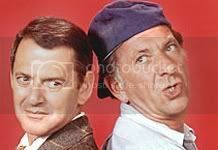 The Odd Couple (ABC, 1970 – 1975): Yeah, we know it’s technically a TV series inspired by a play, but it never would’ve been made if the movie version hadn’t been a success first. Believe it or not, Tony Randall actually wanted Mickey Rooney to play the Oscar Madison to his Felix Unger, due to the success they’d had together when they played the roles together on Broadway, but the series’ executive producer, Garry Marshall, fought for Jack Klugman and won. Looking back at “The Odd Couple,” you may notice that the first season of the series looks notably different from the four seasons that followed. That’s because the decision was made to switch from single-camera to multi-camera, thereby giving the cast the opportunity to perform the show in front of a studio audience…not unlike a play, appropriately enough. No matter what season you happen upon, however, it’s still a TV classic. Sometimes it’s because of the guest stars (Oscar’s career as a sportswriter led to many an athlete being worked into the proceedings), sometimes it’s because of the situations the guys find themselves in (I’m thinking in particular of when Oscar invited Felix to be his partner on an episode of “Password”), but no matter what the scenario, it’s Randall and Klugman who bring home the laughs…so much so that, when you mention “The Odd Couple,” you immediately think of those two guys over Jack Lemmon and Walter Matthau. Now that’s what I call a successful movie-to-TV adaptation! 4. Logan’s Run (CBS, 1977 – 1978): It’s probably a little easier to buy into the idea of a “Logan’s Run” TV series when you realize that the author of the novel that inspired the film – William F. Nolan – actually wrote two sequel novels (“Logan’s World” and “Logan’s Search”) as well as a novelette (“Logan’s Return”), but as it happens, the series stands completely apart from Nolan’s written word. Starring Gregory Harrison as Logan, Heather Menzies as Jessica, and Donald Moffat as an android named REM, “Logan’s Run” sent its characters across post-apocalyptic America by hovercraft on a voyage to find Sanctuary. Given the era, the show was a relatively solid bit of sci-fi, thanks in no small part to having former “Star Trek” writer D.C. Fontana serving as the show’s story editor, but in a rather obnoxious move, Warner Brothers has released the complete series of “Logan’s Run” as iTunes downloads without making it available for purchase in a hard-copy form. Fingers crossed that the folks at Warner Archive will read this and take heed. Better to get a glorified DVD-R version that’s authorized and somewhat cleaned up than a crappy bootleg version.